Download this beautiful T-Shirt – Free PSD Mockup for your business and inspiration. There are two models wearing T-shirt. Choose the best Free mockup exactly for your T-shirt design and present it to your clients. Easily customize this mockup in Photoshop. We are glad to present to your attention our awesome T-Shirt – Free PSD Mockups for your private and commercial needs. If you have an ideas to present the necessary design or attract the attention to your creative product, these awesome and really professional free PSD Mockups can be very useful! This mockup will be great for adding on it the necessary graphic design or elements using Photoshop. Also, it will be very easy to change backgrounds and add any text you wish. Everything depends on your imagination and creative ideas! 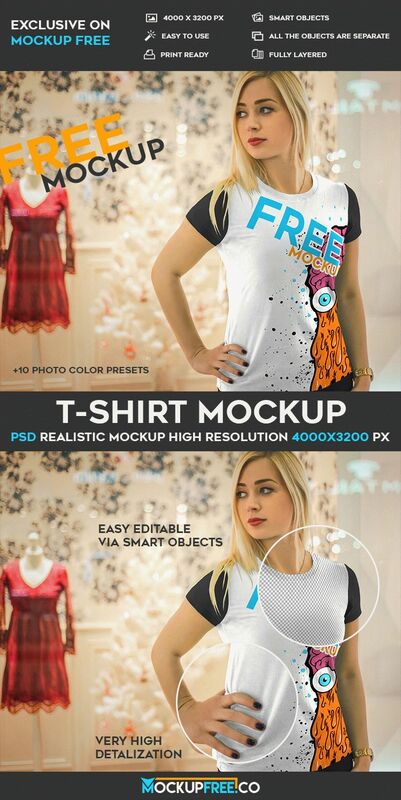 Don’t have any problems with downloading our amazing Freebie PSD Women T-Shirt Mockups for implementing your business ideas, for creating presentations the necessary design to your clients or customers and for lots of other interesting ideas and aims you have. If you think that this free PSD mockup is necessary for your project, download it and use the way you wish!